Serenity Now: Have You Gone Coastal...Completely? One of the best things in the world is that first sight of the ocean you get as you head over the dune after a year (or more, in my case!) of being away from the beach. Waves lapping the shore, sunshine, my toes in the warm sand...it doesn't get much better than that. My newest sponsor, Maya, from the blog Completely Coastal, must love the beach even more than I do because she's created an entire "Inspiration and Shopping Blog for People who Love the Sea." The combination of the warm weather and recent shopping forays into the swimsuit section have my mind on the beach (and getting to the gym). Hopefully today's introduction will help you get your beachy fix too! Maya and her husband live in an old Dutch Colonial on the coast of Southern Rhode Island. 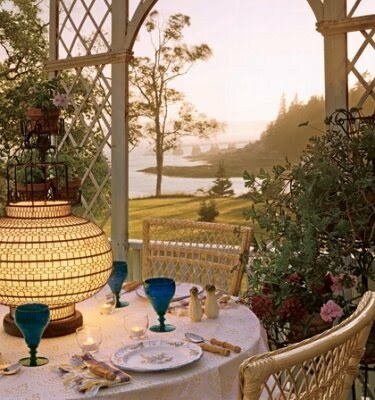 The "completely coastal" couple was only too happy to handle some renovation work because, as Maya says, "a picture perfect view over a coastal water way that includes a sunset and that made it all worthwhile. It's a dream spot. We got it right this time -our first home that's another story...."
I enjoyed browsing Maya's photos of her Coastal Home. Her style is fresh, uncluttered, and, well...coastal. One of my favorite categories I found while browsing Completely Coastal for the first time was the list of Before and Afters. I am a sucker for a good transformation. The story of Maya's Kitchen Remodel made me smile. I love the use of an IKEA island. 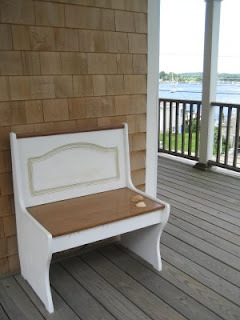 If you're not a believer in DIY work, the photos on the blog might make you sing a different tune. Something I very much appreciate about Completely Coastal is that Maya regularly features other bloggers, artists, crafters, and shops that fit in with her beachy vibe. 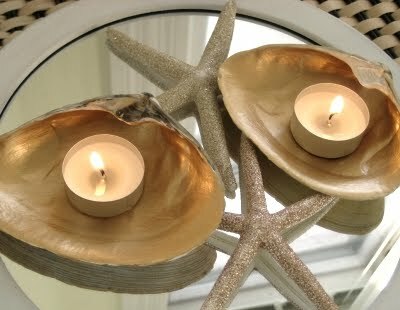 There's a new craft idea to check out each week and monthly reviews of Coastal Living Magazine. or you just want to read about movies by the sea, Completely Coastal has done the hard work and combined some of the best blogs and shops with a coastal influence to share with readers. Maya loves having her own space to "highlight all the beauty" she sees, and her favorite part about blogging is discovering creative crafts, beautiful interiors, and featuring artists, great books, and more. If you're looking for a good blog to add to your Weekend Bloggy Reading, add Completely Coastal to your reader today. Stay tuned tomorrow for a fun tutorial on Vintage Hair Flowers. 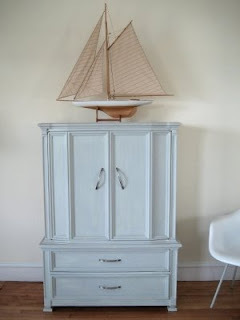 I'll be back on Sunday with some Thrifty Treasures and a cute DIY post for Monday. 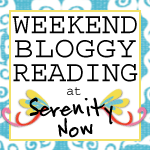 Be on the lookout for some fun announcements regarding upcoming blog parties here at Serenity Now! Happy Friday! Oh her home is lovely. 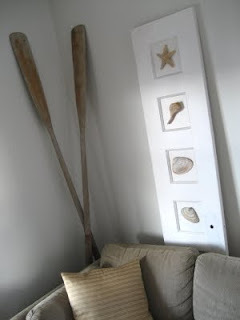 How creative is that door with the shells, love it! Oh gracious! Beautiful! Great post Amanda! Sure makes me want to go on vacation. I need to win the lottery, but I guess I would have to buy a ticket first. Wish I could buy a beach house like that. How come the places I've stayed on the beach never look like that. they always look like cheesy beach houses. these are GROGEOUS! I feel refreshed...like I was just at the beach!! Such beautiful rooms and crafts. 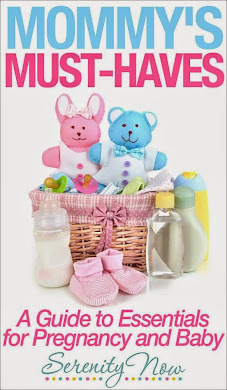 Items to die for for sure. I love Completely Coastal! 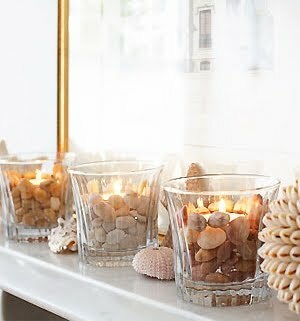 She featured my Beachy Bottles that I did last year on her site. Such great inspiration there! How fun! I wish I lived dean the ocean. I love ocean-inspired decorations! Great sponsoer, I adore anything coastal, thanks so much for introducting us ! Off to take a peek ! 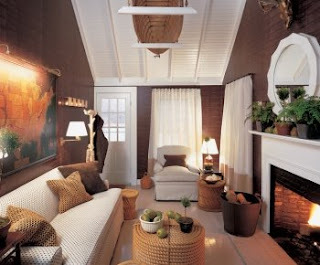 I love the coastal look - but it's a style that doesn't play as nicely with my other eclectic tastes. I'm glad to have other ways to admire this look. Thanks for the intro! ooh, I L O V E browsing her blog! 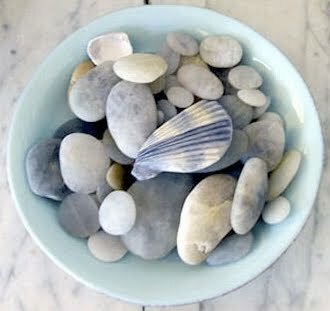 I just adore beach pebbles. Such a charming look!